The exterior walls photographed for this series evidence singular histories, at once legible and obscure, inscribed by utility, time, and decisions made. 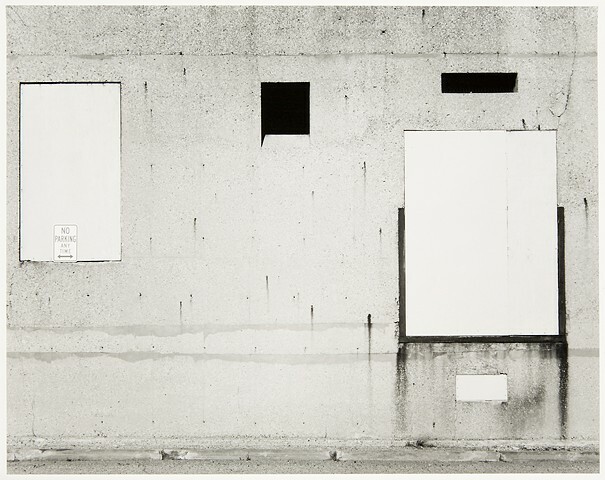 Each depicted wall is photographed flat on, as found, using large format black and white film. The wall series draws analogy between facets of human individuality and walls in our physical world. Inherent in my photographic approach is a reduction of the medium’s visual vocabulary. These images do not have a foreground, background, or linear perspective to designate space. The viewer is confronted with a veneer of material structure vividly recorded. A wall is constructed to meet a specific need and a host of decisions may be made to build it. It might have windows, doors, or air vents. It could be made of wood, metal or concrete, becoming unique in function and purpose. Apparent modifications can represent functional shifts throughout time. Weather stains show environmental effects like facial wrinkles or scars. As conditions change, the facade acquires an ever more singular character. A biography of sorts can be seen.